Indonesia’s political Islam uses democracy to promote conservative aspirations, thus changing the democratic landscape. Indonesian groups considered as political Islam include the Islam Defenders Front (FPI), the National Movement to Safeguard the Indonesian Ulema Councils Fatwa (GNPF-MUI), Hizbut Tahrir Indonesia, and factions in the country’s largest Muslim organisations, the Nahdlatul Ulama and Muhammadiyah. They all have the desire to rule the society with ideals derived from interpretations of Islam. This has prompted political Islam to put forth its aspirations, generally perceived as undemocratic, through democratic ways. Political Islam had almost always been on the fringe of Indonesia’s politics. Its inability to build a coalition of Muslims from all walks of life and persistent internal fragmentation had rendered political Islam incapable of mobilizing significant influence. However, the rise of the conservatives does not necessarily end the exclusion altogether. Even after Reformasi, political Islam in Indonesia still experienced political exclusion. Political Islam has often been portrayed by the media, pro-democracy activists, analysts, and political rivals as a group that harms democracy and pluralism. Research has found the group attracted stigma because of its beliefs. The state, scholars and civil society often treat followers of political Islam as citizens whose behaviors and ideas are problematic, thus needing correction. Moreover, it is not easy for political Islam to get access to formal political institutions. Amid the prevailing democracy and diversity narratives post-Reformasi, these portrayals have made political Islam look like a bunch of deviant people with unreasonable demands. On the other hand, political Islam harbors great suspicion of the narratives of democracy, tolerance and nationalism. Last year and this year signified a new turn. 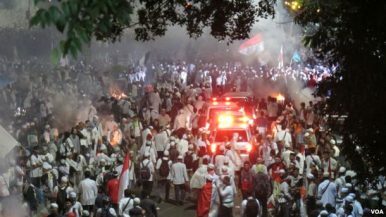 Indonesia saw a string of large demonstrations called Defend Islam Action (Aksi Bela Islam), where political Islam gained momentum and huge public sympathy. This has pushed more established actors in the democracy arena — legislators, political parties, elected politicians, bureaucrats, and businesspeople — to take them into account and regard their demands seriously. To overcome the exclusion, political Islam utilized democratic claims. When its supporters rallied to voice their demands, political Islam expanded its repertoire to include freedom of expression. Another slogan is “everyone is equal before law,” which gives justification for political Islam to pursue its interests using legal avenues. These maneuvers allow political Islam to pursue greater participation in Indonesia’s political arena. Its members acknowledge the rules of the democratic system in the hope of getting recognition as legitimate political actors in the country. Consequently, political Islam tries to construct specific interpretations to connect democracy, tolerance, and nationalism with conservative aspirations. For example, they interpret the campaign against Shiites as an attempt to protect Indonesia’s unity. And the campaign against gays and lesbians is seen as protecting society’s morality. They are doing what they have been doing: controlling political Islam by excluding them. They do this by reproducing negative depictions of political Islam: as anti-democracy, favoring violence, and threatening the national ideology. These portrayals provide justification for the government to limit political Islam movements. It disbanded Hizbut Tahrir Indonesia without trial using a government regulation that could also affect other mass organizations. Pro-democracy agents need to learn more to develop a better strategy in this new landscape. It is clear that moves to treat political Islam as a fringe actor tend to be counterproductive. It would likely harden political Islam’s feelings of exclusion despite having shown willingness to follow democratic rules. This could stunt political Islam’s commitment to get involved in democracy, and in turn might open more paths to radicalization. Negative labeling of political Islam, therefore, should be ended. This is not only because it fails to delegitimise political Islam in the eyes of society, but it also gives followers reason to unite and harden their identity. Instead of treating political Islam’s followers as people who do not have any place in democracy, the government, democracy activists, and researchers should think about how to encourage political Islam to compromise further and accept democratic ideals. Make democracy the sole domain where political decisions are deliberated, so political Islam does not have any choice except to enter and compromise. Or instill democracy deeper in the society so citizens are not easily lured by actors that promote undemocratic ideas. Rizky Alif Alvian is a researcher at the Institute of International Studies, Department of International Relations, Universitas Gadjah Mada. This article was originally published on The Conversation. Read the original article.